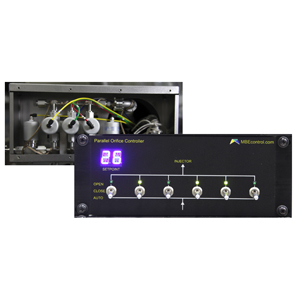 The Riber USA Orifice Controller is a microprocessor based controller that allows the remote and local control of up to 6 independent orifice control valves typically housed in the Riber USA Multi-Orifice Gas Delivery System. The combination of the Orifice Controller and the Multi-Orifice Gas Delivery System allows controlled high speed flow rate changes with a large dynamic range for gas sources. The 64 controller states can be set manually using the front panel switches or automatically using the AMBER growth software via the RS-232 serial port on the rear panel. The Riber USA Orifice Controller has been designed with the end user in mind, by incorporating a simple to use front panel interface and high quality components to provide excellent and reliable performance.